Valves and connectors are for pneumatic tubing systems. Specifically for manometers and gages. Instrument valves are for permanent installation. 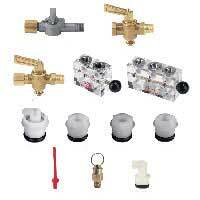 Instrument valves for permanent installation. Gage connectors for manometers. Molded nylon construction.